I made some changes according to your proces. First of all I had the cockpit and hatches cut at panels, before stitching. I just have them ready after unrolling the side and front views of the kayak in Auto CAD. And the second main change, sequent from the first one, is, that I was able to stitch all 6 panels before glueing. As I did. Then I had some problems with aminas during laminating and bubbles at the edges of course. I waste a lot of time for this... Today I cannot say how many hours I spend on building ( I will have to add them together), but it was about 3 weeks of working. And the cost...well it was a bit bigger than I thought (22% VAT- not everybody gives brutto price), but it is still half the price of the cheapest glass-polyester (but not sea) kayaks on the market. I used 3 sheets of 4mm (3,8mm indeed) birch-tree plywood, almost 2kgs of epoxy for glueing and cocpit laminating (it dries much faster) and almost 5 kgs of another type of epoxy for laminating and 10x1,1m of 200grams glass-cloth. As a filler for glueing I used sawdust. And some copper wire. I paint it with transparent urethan varnish with UV filter for yachts. I can see some imperfections in shape (I trusted to much to the 1:1 prints, and I could see them (the mistakes)after glueing and cutting the wires :-( ). Now, I also know, where I lost a lot of time. Next time it's gonna be better! Now I have to make some decks for hatchways. 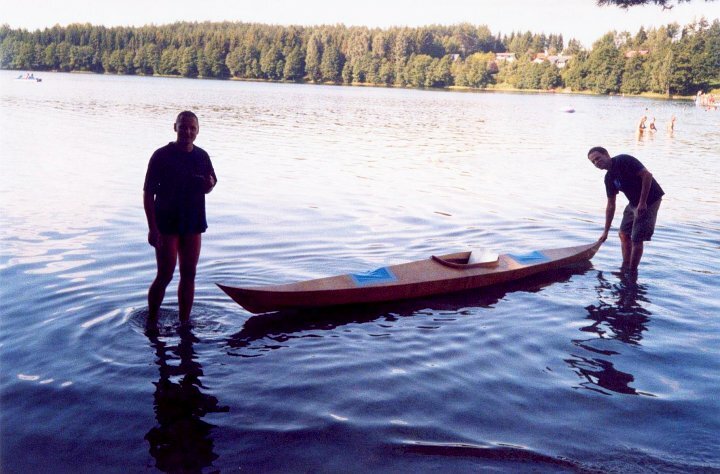 On Sunday I could compare my construction with another plywood kayak. 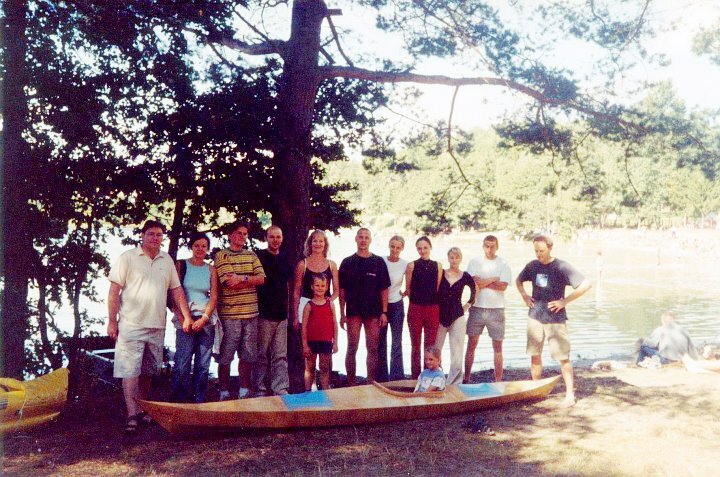 Here is a company (www.hobbo.net) in Poland that produces kayaks as a kits for do-it-yourself. And they came with one of their product. It was wider, longer and much havier than mine. And more comfortable. 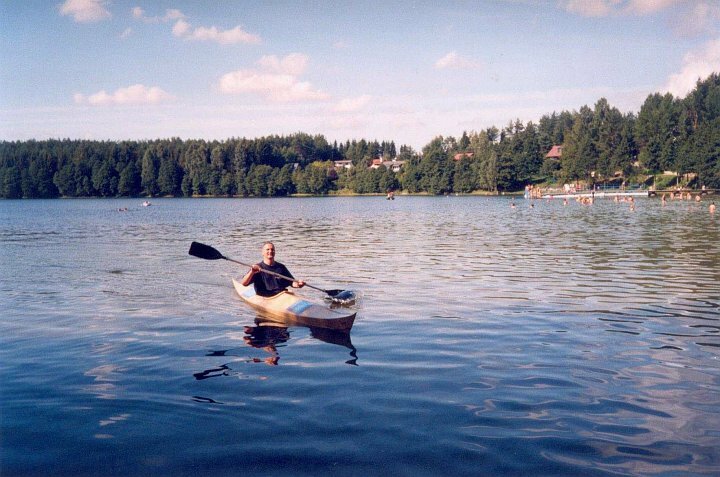 But everybody (including "competition") who paddle both boats agrees that nautic propeities such as speed and acceleration are better in my kayak. It was very nice to hear that ;-) Stability? I would say it is good and I so far I had no problem with that. 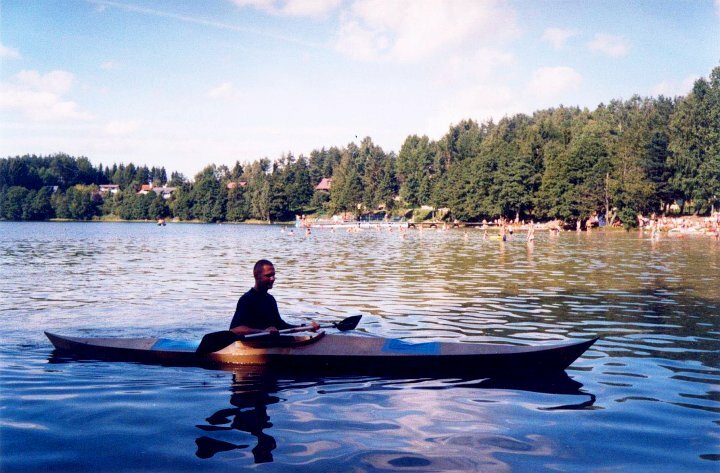 It is hard for steering or I can say it keeps the direction very good...depends, but for lakes and sea it is an advantage, isn't it? 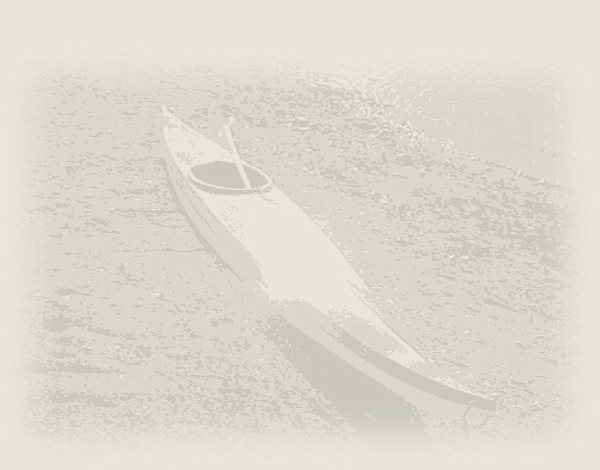 I feel honoured, that you will put pictures of my kayak at your webpage. And the text: well, about the kayak I think you can write a few words based on this e-mail, but I would like to ask you to include this: "Many thanks for my Wife and Daughter for their patience and indulgence, for John Coppens for his webpage and advices, and for others who helped me with this project", OK?